PLEASE, If you have small animal crafts that you would like to share with us, either crafts for the animals themselves or something in the shape of a small animal...Please email them to us at marna@theagilerat.com we would love to have a photo of your craft to add with the instructions for the craft, yes, of course we credit you. This craft is so easy and fun the kids will use more toilet paper just to get the roll to craft a toy and treat holder for their little pets. Take a empty toilet, paper towel or holiday paper roll and cut a piece about 4-5" long. Fold one of the sides into the tube so that the end is now closed. Add a few treats and some seeds to the tube. Fold in the other side. You can give it to the animals just like this or you can decorate the outside with tissue paper, cut or cut and lightly wadded and glued on with children's glue. Some people have taped the ends shut. If you fold the ends into the tube from two sides they will stay long enough for the little guys to have a great time opening them. Leave the empty tube in the rat cage the guys will love to play with it and carry it into their beds and sleep with it long after the treats are gone. Ideas for treats. Yoggie treats, yogurt covered raisins, crasins, nuts, seeds, human cereal pieces, little pieces of breads or even small pieces of human cookies.....try different food or treat items each time...keep your little pets guessing. Rnd 1) Ch 4; (12 dc, 3 hdc) in 4th chain from hook; join with a slip st in 4th chain of beg. ch 4: 16 sts. Do not end off. Row 1) Sc in same st, sc in next st; ch 1, turn work: 2 sc. Row 2) Repeat Row 1. Row 3) Decrease over last 2 sts. Decrease: (Insert hook in next st, pull up a loop) twice, yo, draw through last 3 loops on hook to complete the decrease. Fasten off, secure ends. Row 1) Right side facing, attach yarn to 1st dc on Row 1 of Body (top of ch 3); Ch 3, 2 dc in same st, dc in next 5 sts, hdc in next st; ch 3, turn work, leaving last un-worked st on Row 1 of Body un-worked. Row 2) Dc in next 5 sts, decrease over last 3 sts. Decrease: [yo, insert hook in next st, draw up a loop, (yo, draw through 2 loops) once] 3 times, yo, draw through last 4 loops on hook to complete the decrease. Do not end off. Ch 20, slip st in 2nd ch from hook and in each chain across, slip st in last st on Body of Mouse. Do not end off. Row 1) Slip st in next st, (sc, dc, sc) in same st, slip st in next 4 sts, (sc, ch 2, dc) in same st. Fasten off, secure ends. Skip next 3 sts on Head from where arm is worked, right side facing, attach yarn to next st, (2 hdc, 2 dc, 2 hdc) in next st, sl st in next st. Fasten off, secure ends. Skip next st from where last Ear was worked on Head, right side facing, attach yarn to next st, (2 hdc, 2 dc, 2 hdc) in next st, slip st in next st. Fasten off, secure ends. Glue eyes on face and small bead to center of face for nose. Tie ribbon into a tiny bow, cut off extra ribbon tail and glue around the neck. Glue a flower to hand. 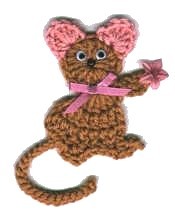 Attach magnet or pin to back or crocheted rattie with glue. This is so easy I am sure you can look at the photo and just make this jump. 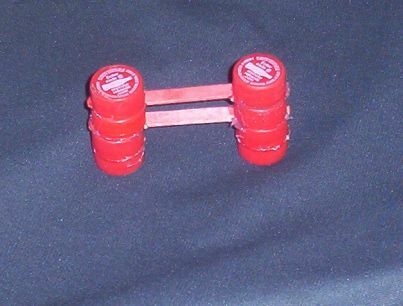 I used eight, 8 Coke bottle tops and two (2) Popsicle Sticks. It is put together with a glue gun. The contents of this page for Small Animal Crafts is a work in progress. Please check back later!